Today we're going to run through multiple platforms to create a warm and sunny typographic treatment. 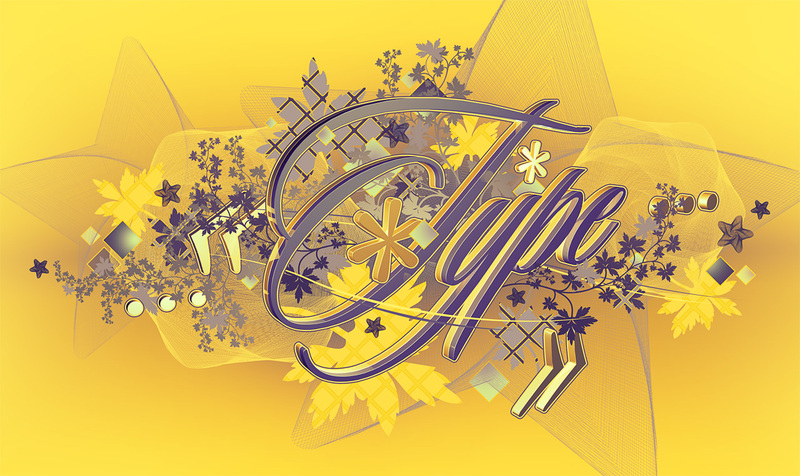 We'll use C4D to create the text, Illustrator for several decorative motifs, and Photoshop to bring them all together. Let's get our hands into creating this warm type illustration. Take a look at the image we'll be creating. You can view the final image preview below or you can view a larger version here. Start up Photoshop and create a new document (4000px by 2000px at 300 ppi). Type up your word, in this case "type," with this font: Sloop. Obviously this isn't a free font because this font doesn't have what free fonts usually have - bugs. The swirls are constant and smooth. Any spikes or inconsistent endpoints will only get worse once we make this into a 3D shape. Another thing to take into consideration is the weight. I wanted an elegant font, but that is also bold enough to work as a 3D shape. If it's too thin, it won't work. Curls or lines that are too thin end up looking like knife blades. Right-click on the type's layer and click on "Convert to Shape." Go to File > Export > Export Paths to Illustrator. Save it as an Illustrator file. Now you'll need Maxon's Cinema 4D, or any sort of 3D software. The instructions here though are based on C4D. Start a new project and go to File > Merge. Open the Illustrator file you created in the previous step. Click and hold on the Hyper Nurbs button. Drag to Extrude Nurbs and release. Find the type path layer in the Objects menu and press the plus button to bring up its contents. Press Command and click on all the paths to select them together. Right-click and go to Connect. After you do that you'll be given a sort "flattened" version of the four on the top of the list. You can delete the old paths, as we will only use the connected version now. Now click and drag the new path onto the Extrude Nurbs effect. That will apply the Nurbs to the path. Click on the path inside the viewing area (I almost said canvas because I have no idea what it's called). In the lower-right corner you'll see the Extrude Nurbs effect. Click on the Object tab and change it to 10 meters. Now click on the Caps tab, and use the following settings. Now that I look at it, 15 steps for a smooth corner is overkill, so just use about 5 to save rendering time. Keep 0,75 or 1 for the Radius though. Anything under that might turn up too sharp in Photoshop when you sharpen the image. Click on the type and copy it (Command + V). Paste it in place (Command + V) and press the middle click button on your mouse. That should bring up four different views. Zoom into the Perspective view so that you can see how close the two type objects need to be. Now use the Move tool to drag the "Z" axis (blue) in the Right view about 12 points. In the bottom menu, click on File > Shader > Nukei. This is a material preset that we will alter slightly. Click on the material's icon in the bottom dock. That will bring up the settings in the lower-right corner. Click on the Diffuse A tab. Think of this one as a primary color. Other colors follow, but we will only change the primary diffuse color. I still want a shade of cyan in there. Change the color by clicking on the Color icon. Now drag the material icon onto the first layer of the text, inside the viewing area. Create a new Nukei material and change the Diffuse A color to this one: R:255 G:241 B:74. Then drag it onto the second layer. It's time to insert some lights. Click on the Add Light Object button and drag it to Area Light. Use the move tool and drag the "Y" axis until the light is at a proper height. Use the rotate tool to make the light face the text. Drag the green axis until the plane is facing the text. Create a second light source on the opposite side. Add one on the top that evens out the luminosity. In the same way as in the previous steps, add a few other characters as shown below. Create only one layer for these and use the golden color. Now go to Render > Render Settings. Change them accordingly. Make sure the pixel size is pretty large. Don't forget to specify the path where you want the render to be saved. When you're done, create a first render by pressing Shift + R.
Find the render in the folder you chose, and open it in Photoshop. Open the Channels menu (Window > Channels), and Command-click on the "Alpha 1 icon." That will make a selection of the text. Go back to the Layers menu and double-click on the "Background" layer. Give it a name. We're doing this just the make it a regular layer. Now press the add layer mask button to hide the black areas. Here's the deal. We don't want to cut out every character away from the render manually. It's easier to make a render of each character separately and just use the Alpha Channel to cut it out from the background. With the original layer underneath, we'll piece it together by aligning each element with its position inside the original render. So go back to C4D, hide all but one element by un-ticking it inside the Objects menu. Render it, and separate it from its background as before. Then align all of them by placing them on top of the old render. One of them is highlighted to show that it's separated from the original render. Now go to Layer > New Adjustment Layer > Gradient Map. Use these colors (left to right): #ffffff, #ffe73f, #542a9a, and #07030e. Set the layer Opacity to 50% and make it a clipping mask for the text layer so that it only influences the text's colors. Repeat the process for the remaining elements, and fill the background with this color: #ffe73f. Double-click on the text layer and add these layer effects. For the drop shadow use this color: #6b506b. Use this for the Outer Glow: #fff260. Over the background layer, paint a shadow with this color: #a89e3b. Now paint a smaller surface with this color: #a89e3b. For this part, you'll need this brush pack. Start a new large document (about 2500 px by 2000 px) and paint with black on a white background (the brush is the first one in the pack). Select everything (Command + A) and paste it in a blank Illustrator file. The large size will make it easy to vectorize. Inside Illustrator, press the Live Trace button, and change the color to this: #776767. Copy and Paste it inside the Photoshop document. Use the second brush inside the brush pack and vectorize them as well. Just use this color instead: #3c2958. Go back to Illustrator and use the Direct Selection Tool (A) to copy only a single leaf out of the whole brush. Pick out a larger one for the most quality. Paste it in Photoshop with this color: #a39485. Add these small leafs all over the other branches. Now we'll create a complementary pattern. Start a new Photoshop document (165 px by 165 px at 300 ppi). Bring up the ruler (Command + R) and drag guides that will snap to the edges of the canvas. Select the Crop Tool (C) and drag it over the whole canvas. Hold Shift and Alt, and drag the box until you get about double the canvas size. Use the Round Rectangle Tool (U) set on 10 px radius to create a symmetrical rectangle (Hold Shift when creating). Duplicate it, move it a few pixels with the keyboard (remember the number) and create a similar pattern as shown. Crop the document back to its initial size by snapping it to the guides. Fill the background color with #533d63 and shape color with #ac9c8f. Double-click on one of the shapes layers, and add a 5 pixel, inner stroke with this color: #ecdd18. Then go to Edit > Define Pattern. Select the Bucket Tool (G). From the drop down menu near the top of the screen, select Pattern. Make a clipping mask for one of the leafs, and fill it with this pattern. Fill a few other leafs with the same pattern. Change the colors around the pattern file with different shades of yellow, and fill some with those. Now we'll add a few vector motifs. First of all, start a new Illustrator document and select the Polygon Tool. Hold the tilde key (~) and drag as indicated by the arrow. Don't stop dragging until you've reached the end of the next step. I made two screenshots to break down the entire motion. After dragging up, drag back down toward the center in a spiral pattern. The speed of your dragging determines the amount of lines. This is what it should look like. Change the motif to this color: #f5e750. Place it in the Photoshop document as a Smart Object. Place a second larger one on the left side. Create another motif, but using the Star Tool in Illustrator. Add a few small stars all over the canvas as well. Now create a rectangle somewhere inside the composition and give it a 5 pixel inner stroke, just like the pattern. Use this for the fill color: #543d63. Make a clipping mask for this shape, and paint with a soft brush with this color: #cbef8e. With the same two colors, create other rectangles. Repeat this process to sprinkle these motifs all over the composition. Keep it subtle and tasteful. Now create a new blank layer above the text, and use the Pen Tool (P) to trace in path mode what will soon be a thin line. When done, use the Brush Tool (B) to edit the settings (chose a small, hard brush) and press P when you're done. Right-click, select Stroke Path, tick the Simulate Pressure box and press OK.
Repeat the previous step to create a few more lines. Don't add too many though. And finally, we'll touch up the yellow values and make it look warmer. On top of all the layers, go to Layer > New Adjustment Layer > Selective Color. From the drop down menu, select Yellows and drag the sliders to the numbers shown below. That's all folks! If you're sure you want to get into type treatments, 3D is a great way to go. I didn't think I'd need a 3D program, and thought that Illustrator's Extrude and Bevel feature was all I needed. Well, I was wrong. 3D opens up a whole new dimension - literally!